In this Sept. 17, 1941 image, the Swedish destroyer Klas Uggla, No. 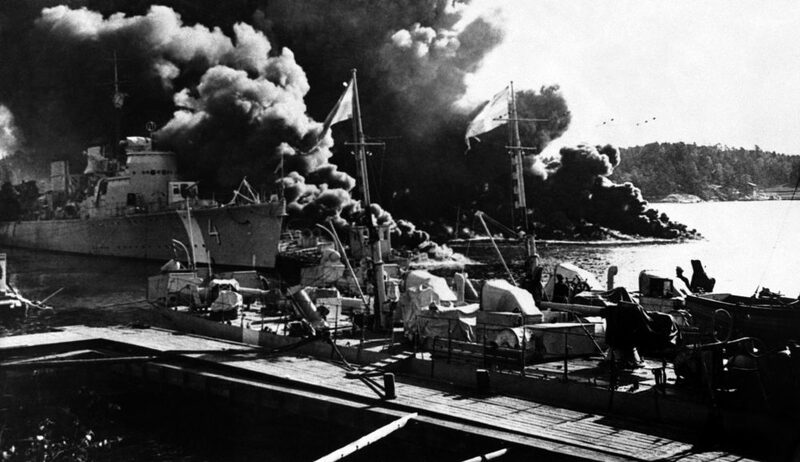 4 left, is seen ablaze after an unidentified accident which destroyed the ship, damaged two others, and killed 33 sailors in Horsfjarden, Sweden. The small boats, in foreground, were towed off to safety unharmed. Photo by Associated Press. Economic inequality has always been with us, and when you observe a dramatic market compression you can always link it to a disastrous event. These events come in four flavors: intense popular military mobilization, violent and transformative revolutions, state collapse, and catastrophic epidemics. These are very severe episodes that hold true across history. It is very hard, if not impossible, to find any episode of major equalization that is not linked to one of these four types of events. Just as in many other developed countries at the time, external shocks—in the form of war and the Great Depression—acted as critical catalysts for Sweden’s redistributive fiscal reform and the eventual expansion of the welfare state. Although Sweden is located at the margins of the European continent, it is adjacent to the major powers involved in both world wars: Germany, Great Britain, and Russia. In World War I, conservative Swedish elites sided with Germany and raked in large profits while food shortages caused by the Entente naval blockade and labor unrest rocked the country. Hunger marches near the end of the war triggered heavy-handed police responses. Sweden, a nonbelligerent, largely missed out on the World War I surge in top taxation, and continued to lag behind Europe’s liberal democracies until the next war. Military mass mobilization, progressive graduation of tax rates, and the targeting of elite wealth on top of income constituted the three main ingredients of fiscal leveling. Popular discontent paved the way for the country’s first Liberal-Social Democrat coalition government, which started to take tentative steps in a more progressive direction under the growing shadow of the Russian Revolution not far from Sweden’s shores. Once the war had ended, overseas markets collapsed and industrial overcapacity ushered in financial crisis and unemployment. The wealthy, deeply enmeshed in these businesses, suffered disproportionately. During World War II, when Germany invaded Denmark and Norway, Sweden was completely surrounded by the Nazis and their allies. Once the Nazi war machine had shifted into high gear, as a leading Social Democrat politician in 1940 put it, the Swedes found themselves “living in front of the muzzle of a loaded cannon.” The country was exposed to both German and Allied pressure. At one point Germany threatened to bomb Swedish cities unless granted transit concessions. Later in the war, Germany drew up a contingency plan for an invasion in the event of an Allied incursion into Sweden. The Swedes had to put virtually everything on a war footing to stand a chance of defending themselves against an invasion. They experienced full mobilization—there was no actual fighting, but they mobilized a very large share of their population. They had to create military industries virtually out of nothing overnight. This crisis transformed what had been a right-wing military force into a people’s army based on mass conscription and volunteerism. Some 400,000 men served out of a population of 6.3 million, and of those, 50,000 soldiers were invalided as the result of injuries, accidents, and harsh service conditions. Strict rationing among the civilian population served as a crucial means of leveling class differences. Shared military and civilian service helped overcome existing distrust and fostered teamwork and mutual dependency. The vision of Sweden as a small country that had been saved by a coalition government and societal consensus contributed to the formation of the ideal of a solidaristic society sustained by a redistributive welfare state. All these things together produced an effect quite similar to what happened in countries that endured actual fighting. People were more willing to go along with it because of the perceived existential threat. This shows that societies did not have to experience this mass violence firsthand. It was enough if it happened next door and there was a serious risk of getting involved, and everyone had to prepare for this. Sweden’s eightfold military build-up during World War II dramatically boosted income tax rates for top earners and corporations. Whereas fiscal responses to the Great Depression had remained modest, the tax reform of 1939 greatly raised top rates and created a temporary defense tax that became highly progressive only for the highest earners and that was further sharpened in 1940 and 1942. In addition, the statutory corporate tax rate rose to 40 percent. The strengthening of military capacity was the official rationale for all these measures. Thanks to the threat of war, in a telling departure from the fractious politics of the 1920s and 1930s, these reforms were passed with little debate or controversy as an almost unanimous political decision. In this sense, Sweden did experience a major war mobilization effect that was conducive to the subsequent expansion of the welfare state. In the longer term, the war years left their mark on popular beliefs: The vision of Sweden as a small country that had been saved by a coalition government and societal consensus contributed to the formation of the ideal of a solidaristic society sustained by a redistributive welfare state. After the war had ended, this program carried the day. The people had sacrificed during the war, and now expected something in return. The shared experience of the war years was the crucial catalyst for the blossoming of the Swedish welfare state. But this may now, in fact, be changing. The offer of generous welfare for anyone who shows up in Sweden ended last spring when the country restored border controls between Sweden and Denmark for the first time in decades. And this was merely the latest step. Following a severe fiscal crisis in the early 1990s, the government had long been cutting back on welfare provisions and promoted privatization of public services. Thanks to these measures and the impact of globalization and technological change, income inequality before taxes and transfers has been rising for decades. Sweden’s future, just like that of many other European countries with aging populations, depends on continuing immigration, in no small part from Africa and the Middle East. As Swedish society becomes more and more ethnically, culturally, and religiously diverse, the social consensus on redistribution faces growing pressure. Europe has already shed much of its progressive postwar culture, and we must wonder how well Swedish egalitarianism will stand the test of time. Walter Scheidel is the Dickason Professor in the Humanities, Professor of Classics and History, and a Kennedy-Grossman Fellow in Human Biology at Stanford University. He is also the author of The Great Leveler: Violence and the History of Inequality.